Your fees will be a minimum of 60% of the lesson price charged to the student. Tutors can freely decide how much the lesson price will be. Currently, we use a point system (1 point = 1 JPY) for lessons charged to our students. Usually, we make big discounts so that our students can purchase points for lessons at a discount rate. The discounts will be applied for those who have membership with Cafetalk's partner companies and purchase points in bulk. As you can see, as part of a campaign or a show of goodwill to tutors, Cafetalk may charge LESS than the amount specified without prior notification. That is to say, your fee will NEVER be below 60% of the unit price although it could be more in the near future. We have some tutor classes with more profitable fee rate depending on how many lessons you complete per month, feed backs from students, and so on. Please check out this article and our tutor blog. Cafetalk's margin rate starts at 60% of the lesson price and changes according to the following criteria. The variable rate (B): depending on monthly sales and reliability. Your rates will be calculated on the first of every month (times are based on GMT) and the better of (A) and (B) will become the effective rate for the month. The higher sales of two previous months will be used for calculation. If the margin rate calculated based on sales is less than 70% the following 'reliability' bonus will take effect. Please note that you must be active as a tutor in the given calculation period (one and two months respectively) and you must have at least one paid request per month. Please note that we may withhold payment of your fees or even suspend your account without warning or notice in the event that you fail to deliver a confirmed lesson, engage in any misconduct or violate the Tutor Terms (See 8 and 11-5 of the Tutor Terms). 2. How do tutors get paid? Tutors can have their Cafetalk earnings paid out to their Payoneer accounts or directly to a bank account via Payoneer. For residents of Japan and Korea we offer direct payment to local bank accounts. 3. When do tutors get paid? Tutors may request payment for all lessons completed one or more days before the request date provided that the total owed to you exceeds 3,000 Points (= 3,000 Japanese Yen). 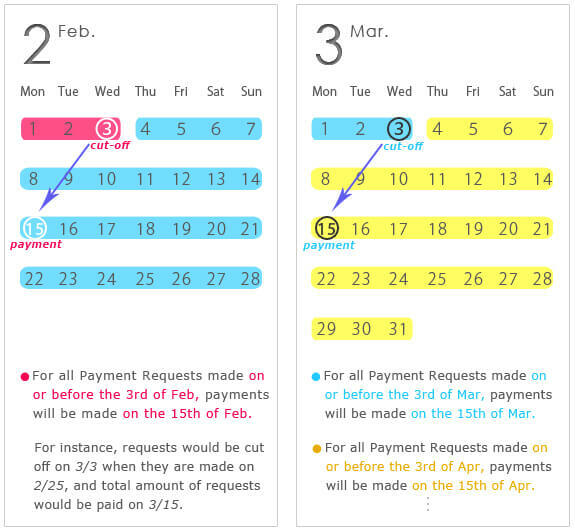 Upon receiving a Payment Request Cafetalk will initiate payment using the method you specified according to the following schedule. For all Payment Requests made on or before the 3rd of the month, payments will be made on the following 15th. Cafetalk pays for fees required to transfer the Lesson Fees into the tutor's account. However, tutors do have to pay for any fees related to 'receiving' money into their account, or withdrawal thereof. For instance Paypal charges a receiving fee as well as a currency conversion fee if you choose to receive the funds using a currency different to the payment currency.